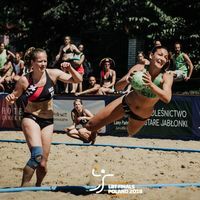 There is no shortage of European beach handball this weekend, with a total of seven European Beach Handball Tour (ebt) tournaments being played in Spain (3), Italy, Hungary, Cyprus and Poland. All of them start this Friday and conclude on Sunday. Spain is the beach handball hotspot, with the XIV Beach Handball Calella tournament being played in Barcelona and two ‘Arena 500’ tournaments being played in Vigo and Valladolid. Cyprus hosts the Larnaca beach handball tournament. In Spiaggia di Serapo, Italy, the XVII Calise Cup takes place. The tournament’s final is streamed live on the Italian Handball Federation’s Youtube channel, Pallamano TV. On top, two European capitals receive their fair share of top class beach handball. In Budapest, the III Budapest Cup is being played. A live stream of the matches is available via the organiser’s website. In Poland, the PGNiG Summer Super Liga makes its fifth stop in Warsaw. Five tournaments have already been played. The two final events are being held in Gdansk (20 to 22 July) and Stare Jablonki (3 to 5 August). The matches are streamed live on the competition’s Facebook page. With these tournaments, this year’s ebt season reaches half-time. After 28 of an overall 65 tournaments have been verified, BHT Pyrki Poznan from Poland lead the women’s rankings with 1,283 points ahead of BM Playa Algeciras on 1,112 points. The men’s ranking is topped by multiple ebt Finals winners, Detono Zagreb, with 1,395 points. Second are Escola de Formação de Espinho - Os Tigres from Portugal with 1,288 points. For more info also visit the ebt’s official competition website.